When you and your family enjoy Farinacci Pizza, you are getting more than great taste. You are not only getting the best nutritional value of ALL fast foods, you are also tasting a family recipe that dates back to the early 1900's. 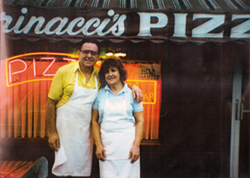 Grandma Farinacci made her dough and sauce on a regular basis. Coming from Italy, growing their own fruits and vegetables was commonplace. Everything was always fresh. 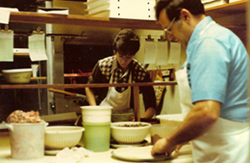 Farinacci Pizza maintains that tradition every day. Our pizza and dressings are made without preservatives. We use only 100% real cheese. Our dough is made each day we are open for business. We use only natural seasoning in our sauces. None of our products are pre-cooked or frozen. 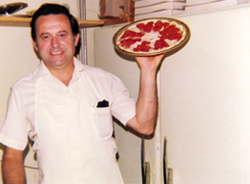 Established in 1971 by Nick Farinacci Sr. and his wife Josephine, Farinacci Pizza continues to serve Northfield Center and surrounding communities. Throughout the years, the whole family has been employed by the shop at one time or another. Nick Farinacci Jr. helped maintain the consistency of the product for many years. Nick Jr. passed away in March 2012, but his hard work and dedication continues through his brother Joe, who has expanded the business to include Hudson and Cuyahoga Falls locations. Dedication to consistency comes from the roots of our family's heritage not only in the food we make, but in the lives we live. We hope you get an opportunity to share in the tradition of Farinacci Pizza.